More media choices means dealers are spreading their advertising dollars around. Before the internet, TV was the dealer’s best friend. Today, dealers are finding targeted online advertising is equally effective. And social media is advancing quickly. As new and more effective channels mature, it’s not surprising that older, less impactful channels are receiving a shrinking slice of the media spending pie. As this post from Gordon Borrell of Borrell Associates explains, it’s newspaper advertising that’s taking the hit. 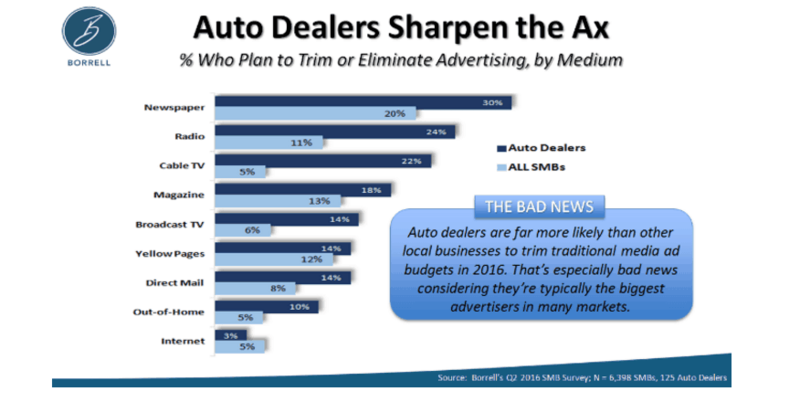 In fact, a full 30% of dealers plan to trim – or even eliminate – their print advertising budgets. In our analysis, it’s not the case that dealers are reducing their overall spend. It’s more likely that they’re distributing their budgets among multiple media sources, in a concerted effort to avoid siloed spending and reduce waste. To bring increased transparency and precision to their spending, a growing number of dealers are utilizing the LotLinx VIN View Optimizer™. They’re finding the VVO offers a precise look at how much attention specific VINs inventory are receiving online, so they can direct spending to those that need a boost to turn on time. It’s a level of detail that’s proving to be vital to ensuring no dollar is wasted. You can access this innovative tool right now, absolutely free. Or, if you prefer, give us a call at 800-625-5469 to have a LotLinx digital specialist walk you through the process.